As much as one-third of the surplus CO2 in the atmosphere driving climate change has resulted from land management practices on agricultural lands. Carbon farming, an array of strategies designed to promote long-term carbon sequestration, holds the potential to significantly reduce atmospheric greenhouse gases by capturing carbon in the soil and plant material, while enhancing soil health and productivity. The RCD and its LandSmart® partners are working to develop a carbon planning component to the comprehensive conservation plans developed through the LandSmart™ program, identifying practices that would allow agricultural operations to increase carbon sequestration and reduce greenhouse gas emissions. These practices would provide multiple benefits for climate change resiliency, by reducing atmospheric CO2 levels while improving soil health, water holding capacity, and crop and forage production. Practices also promote water conservation and reduce irrigation needs, reducing stream withdrawals and thereby enhancing water quality and instream habitat. Finally, practices such as hedgerows and windbreaks work to both sequester CO2 while enhancing on-farm wildlife and pollinator habitat. Gold Ridge RCD is accepting applications for LandSmart(R) Carbon Farm Plans on a continuous basis. For more information, contact Jason Hoorn at Jason@goldridgercd.org or (707) 823-5244. Gold Ridge is collaborating with other North Bay RCDs to create a comprehensive program for carbon farming on multiple agricultural sites: Orchards, Forests, Vineyards, Rangelands, and Croplands. Learn more about carbon farming and see a list of carbon farm practices applicable to some of these sites. In the words of our Executive Director, Brittany Jensen, carbon farming is a regional tactic to address a global problem. “By helping farmers make carbon farming a part of their daily operations, we have the opportunity to work on a global problem – climate change – and make a local difference. By working on carbon farming with other North Bay RCDs, we also have an opportunity to strengthen our regional mission to build climate resilience across northern California." The Gold Ridge RCD has funding to write carbon farm plans with farmers through our Regional Conservation Collaboration Program (RCCP) Grant for the next few years. However, there is a regional shortage of compost, the application of which on rangelands is a major practice on rangeland carbon farms. We are looking for new sources of large quantities of compost. Contact Jason Hoorn at Jason@goldridgercd.org if you want to provide RCDs with your compost. Hosted at the beautiful SRJC Shone Farm, the Gold Ridge, Sonoma, Mendocino and Napa RCDs, the USDA's NRCS Ukiah Office, UCCE Mendocino and the Santa Rosa Junior College came together this November to discuss current research on vineyard climate-beneficial practices for our region. These might include timed irrigation/fertigation to increase nitrogen uptake by vines, compost application, hedgerow planting, cover cropping and grazing, reduced an non-tillage, and more. 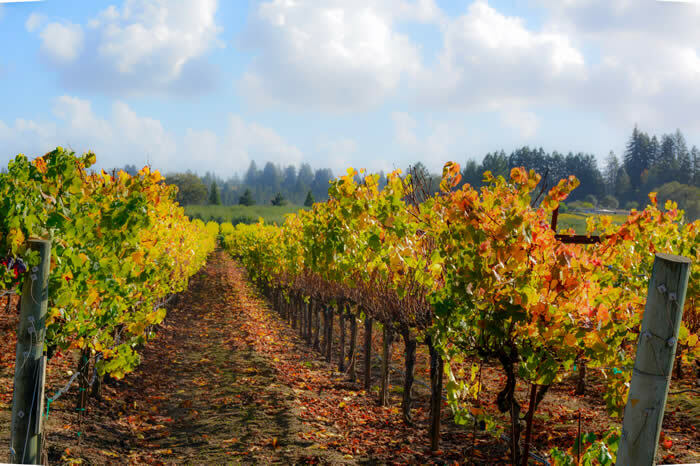 These practices are being examined for their ability to sequester carbon dioxide, retain water, reduce the need for synthetic fertilizers, amendments and pesticides, and maintain grape quality and quantity. This meeting will help inform the RCDs as they start assisting vineyards to create LandSmart Carbon Farm Plans. © 2016 GRRCD 2776 Sullivan Rd., Sebastopol, CA 95472. All rights reserved.